OUR car trips, even ones to the corner shop, are more often than not rambunctious affairs usually filled with much laughter, a fair bit of whining, bad singing, even worse jokes and about a gazillion questions. As is the way with children, topics vary. There is maths with the repetitious timetables, science with how we can get jaffles to explode out of dad's birthday cake and English with how excellent it would be to get locked in with the Oompa Loompas for the night. "It's to open and close the window," I say. They laugh. "You are just being silly," says the little one. And then it dawns on me. These lucky children who, since birth, have been swanning in and out of different cars have never before seen a manual window winder. "Oh," says the just-turned seven-year-old with that wise air of a, well, seven-year-old, "it's from the olden days!" That's probably all that's "old" in the Panda Trekking - a car so touched with all things modern and eclectic that it certainly sets it apart from the usual offerings. The Panda, of course, has been popular on foreign shores for more than two decades but only announced its arrival in Australia in mid-2013. It extends Fiat's range here from the 500 and Punto as the Italian manufacturer looks to stir up the status quo. The Panda is available in the Pop, Easy and Lounge in a variety of eye-catching colours from a drive-away price of $16,500. The Trekking is its SUV-like version with roof racks, door cladding and raised ride height. Squircle is the design buzzword for the Panda and this interesting mix between the two shapes is to be found in abundance both on the inside and out. 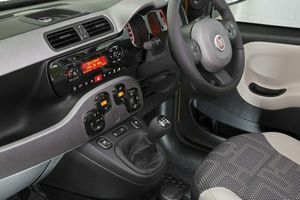 The square with the rounded edges dominates the dashboard and instrument binnacle, the speakers, door handles, cup holders, audio controls, speaker surrounds, gear lever knob and ventilation surrounds. It adds a certain appeal, too, distinguishing the Panda from its competitors but also keeping the relationship with such a unique exterior styling. The driving position is higher, comfortably so, and it combines well with large windows to offer great visibility. space increasing to 870 litres with the 60:40 rear seats folded even though they don't stow flat. The small SUV-like Panda Trekking is powered by a 1.3-litre turbo diesel and while power (55kW) is on the low side it is boosted by the 190Nm of torque available, luckily, from 1500rpm. That gives the Panda Trekking that extra oomph to see you through those hairier on-road situations. Around town is its forte, with a tight turning circle and slender body making easy work of small spaces. The Panda Trekking will not desert at speed either, while drivers around you are doing a double-take on the exterior, the Panda will zip past with glee. The loud diesel greeting at idle peters out on the highway and there is only an inkling of road noise to disturb you over 100kmh. This is an easy car to manoeuvre, gears smooth and effective, although a sixth wouldn't go astray on the highway. Steering is light and predictable. It settles nicely into corners except for the slight body roll you expect courtesy of its shape and is above-all a fairly fun drive. The Panda Trekking may hanker to be an SUV, but it is at best an illusion. Although the entry-level Panda Pop will set you back just $16,500 (drive- away), the Trekking at some $8000 more is considerably dearer. For that, however, you can expect heated front seats and windscreen, leather wrapped steering with multi-function controls, front-powered windows, roof rails, climate control, fog lights, 15-inch alloys and reverse sensors. There is also a six-speaker audio system with Bluetooth connectivity and USB inputs. A Tom Tom navigation unit is an optional $540.50. Safety includes six airbags, ABS brakes with brake assist as well as stability and traction control. Also consider the Peugeot 2008 Outdoor (from $31,990), Kia Soul CRDi (from $27,990), Holden Trax (from $23,490) and Nissan Juke (from $21,990). The Panda Trekking ticks the boxes next to space, easy to drive, compact make-up, good fuel consumption and quirky looks. It is a real-world option for young and old couples as well as small families. Fuel consumption is claimed at 4.2 litres/100km - our test week returned figures almost a litre dearer. 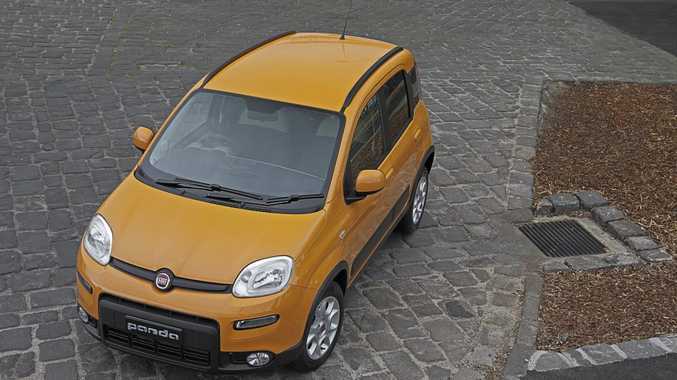 Fiat Panda will capture attention, whether it captures the imagination probably depends on how much you love all things Italian. It will stand out from the crowd with its boxy design, its homage to squircles and less is more frugality. What we liked: Quirky looks, stylish interior. What we'd like to see: A bit more power, auto windows, lower price. Warranty and servicing: Fiat offers a three year/150,000km warranty and roadside assist for the same period. Servicing intervals are annual or 15,000km. Details: Five-door front-wheel-drive small hatch. Engine: 1.3-litre four-cylinder turbo diesel generating maximum power of 55kW @ 4000rpm and peak torque of 190Nm @ 1500rpm. Consumption: 4.2 litres/100km (combined average). Bottom line plus on-roads: $24,000 (Panda Pop at $16,500 drive-away).